Experience Rainforest in a much cleaner and easier to use interface. We redesigned the entire platform from the ground up and will be giving a live demo on Rainforest 2.0. We will also introduce a new set of tools that make it easier to organize your test suite and view your test coverage. The session will conclude with a live Q&A. Over the years, techniques, methodologies, and ways of thinking have been introduced to the software testing industry that added value at one point, but they have now become stale, less impactful, or even downright counterproductive. It’s time to update your testing views. Watch this webcast to learn different approaches and recommendations to help you either remove these harmful strategies and replace them with more meaningful ones, or modernize them to ensure innovation is a driving force within your testing team. Developing a QA strategy that works well is challenging. Developing a QA strategy that continues to work well as your organization scales is even more difficult. While the market demands faster deployment cycles than ever before, QA teams are smaller than they have ever been, and many struggle to move as fast as they need to. There’s no one-size-fits-all QA process, but the most successful teams have a few key characteristics in common. Join this web seminar to discover how organizations keep their QA teams and processes lean while gaining the insights they need to ship high-quality software. Test automation is often held up as the QA endgame. Teams mistakenly believe that if they can crack the automation code, all of their quality problems will be solved. But even when implemented perfectly, automated tests are brittle, flaky, and require significant upkeep. Automation is a critical QA tool, but it's not a magic bullet. To get the most out of automated testing and deliver high-quality releases, QA teams must devise a strategy that balances cost management and speed. - the best tools and processes to complement your automation strategy. In the software economy, innovation and speed are the new standards. However, teams cannot just focus on speed without considering the risk of delivering poor end-user experiences. How can teams create test strategies that prioritize and balance both quality and speed? Join this web seminar to learn how teams can build strategies that balance the demands of a fast-moving release cadence with customer expectations for quality. According to a survey conducted for the 2017-2018 World Quality Report, 29% of executive teams expect their QA and Software Testing strategy to contribute to business growth and outcomes. However, software quality leaders often struggle to tie their QA strategy to business goals. So how do you translate a business goal into a QA strategy component? Data scientists have spent decades trying to figure out how to qualitatively evaluate code quality to better understand what is “good” code and what isn’t - objectively, definitively and without emotion. While it is an interesting area to explore, is it a futile effort? After all, it isn’t uncommon for developers to disagree on how code should be approached to reach the same outcome. This is the first in his series of literature reviews for people who are interested in learning about notable research journals. As products and organizations mature, testing and QA become more critical to the overall success of a business. The ideal QA strategy should be fast, reliable, and fit right into a modern continuous integration pipeline. This leads many technical leaders to conclude that everything should be automated. In reality, not everything can, or should, be automated. Leaders must make difficult, high-impact decisions on behalf of their teams by asking: What should be automated? When should investments in automation be made? Is automation the most cost-effective solution to delivering quality? An agile QA process is essential for any development team or organization's success. Creating an effective QA process is challenging, even for small organizations. As organizations grow in size and complexity, they must adapt their QA strategy to keep up with and stay ahead of development and product goals. How can fast-growing teams scale their QA processes efficiently, without creating a bloated, time-consuming or expensive processes? Most developer testing strategies require developers to pull double-duty, juggling both writing code and testing it. Although adding testing tools and procedures to developer processes can increase code quality and ownership, it slows down productivity significantly. How do organizations empower their developers to own quality without creating distractions that take them away from building and releasing innovative, new features? Test automation is often seen as the driving force behind continuous delivery and agile practices in the application era. However, while test automation can help speed up the building and testing of apps, not every test case is a great fit for automation. Whether teams are developing a new QA strategy or optimizing an existing process, testing should be fast and reliable. But how do teams determine how to use test automation to the greatest impact, and when is human input critical to delivering exceptional customer experiences? Development cycles are moving faster than ever, and many teams now design QA processes to keep up with that speed. But what can teams with legacy code and older test databases do to bring their existing features up to speed? In this webinar, we’ll discuss QA strategies and tools that teams can use to address the challenges of maintaining legacy features and applications. Development teams are shipping more features, faster than ever, and each release carries the risk of introducing bugs to your users. To ensure customer happiness, teams must have confidence that their QA process will catch any existing issues before they reach production. An effective strategy for identifying and addressing bugs is an essential component of any healthy QA strategy. With shorter sprint cycles and more aggressive release cadences, many agile teams feel forced to choose speed over quality. However, the impact of poor software quality on a company’s bottom line proves that quality is a critical component to consider when trying to get new features to the market. By embracing continuous integration and continuous delivery (CI/CD), many teams are able to perform continuous testing and successfully adapt to shorter sprint cycles while maintaining the quality of their code. Join this web seminar to discover how agile teams can strike the right balance between software quality and speed to achieve their goals while keeping customers happy. QA budgets are getting bigger but QA teams are getting smaller, with many fast-moving organizations forgoing a QA hire for as long as possible. But how do you keep quality high without a QA team? 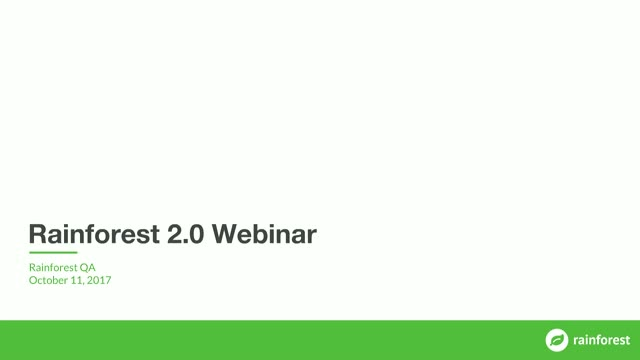 In this webinar, Rainforest engineers discuss how they’ve successfully implemented a developer-owned QA process at Rainforest. Implementing a more strategic approach to testing can have a huge impact on product quality, but measuring exactly how your QA strategy has made a difference can be challenging. The long-term success of any QA strategy depends on measuring change and communicating that change to the team at large, so it’s important to measure the right metrics. It’s easy to get into the mindset of testing-all-the-things. But aiming for quantity over quality will still leave you with coverage gaps, while also dragging down the speed of your QA cycle. In this webinar, we’ll talk about how to determine how much you should be testing, and how to design your QA strategy to fit the needs of your team and product. 2. Build test suites strategically to maximize impact. 3. Cover all your bases without compromising time & resources. Agile teams are beginning to test earlier than ever before in order to improve quality, shorten test cycles and reduce the possibility of releasing bugs. To successfully move fast without breaking things, teams must integrate quality assurance into their CI/CD processes. Automation is a critical QA tool, but it's not a magic bullet. To get the most out of automated testing and drive high-quality releases, teams must devise a QA strategy that balances management costs and testing speed. Join this web seminar to learn how to create a balanced test automation strategy that satisfies your team’s needs. Many teams are now “shifting left,” and starting their QA process earlier in the development cycle. But in most cases shift left testing was confined to unit testing alone. While unit testing is a core component of a continuous testing strategy, teams that want to optimize for speed and quality should shift functional testing left, too. Writing software is hard, with projects easily reaching hundreds of thousands of lines of text. Source control allows developers to manage these giant corpuses, tracking who made what changes and when. In this webinar we’ll talk about how you can use the same source control systems to manage tests and their results, so you always have a record of what happened and when.